Whilst equities continued to push higher, the VIX saw minor chop in the 11s, settling +2.0% @ 11.70. Near term outlook is for VIX to remain subdued, within the 13/10 zone. Single digit VIX is looking increasingly difficult. 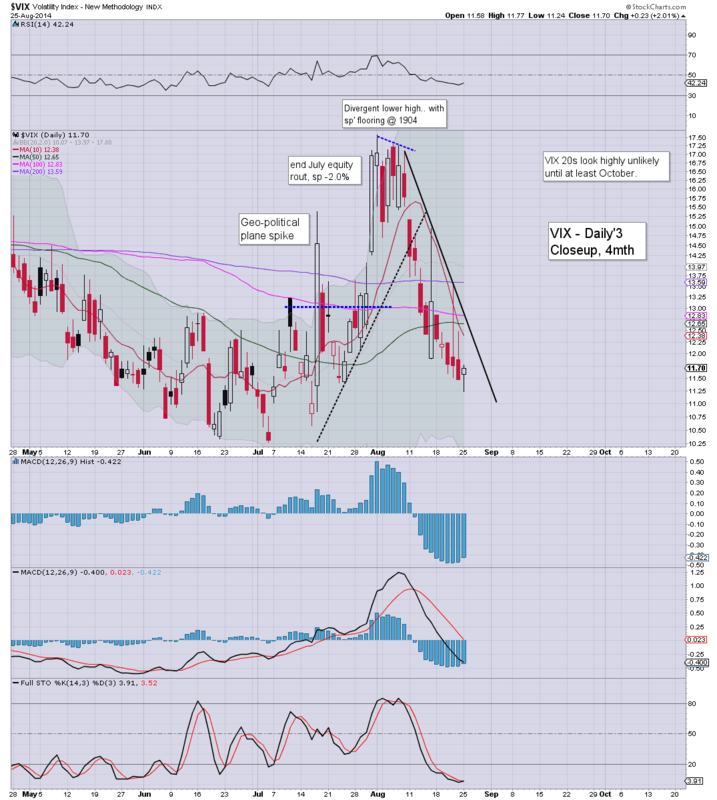 VIX is low..and will probably remain sub mid-teens until late September - barring any 'spooky news'. The 20s look unlikely until at least October..if at all, in the remainder of this year. 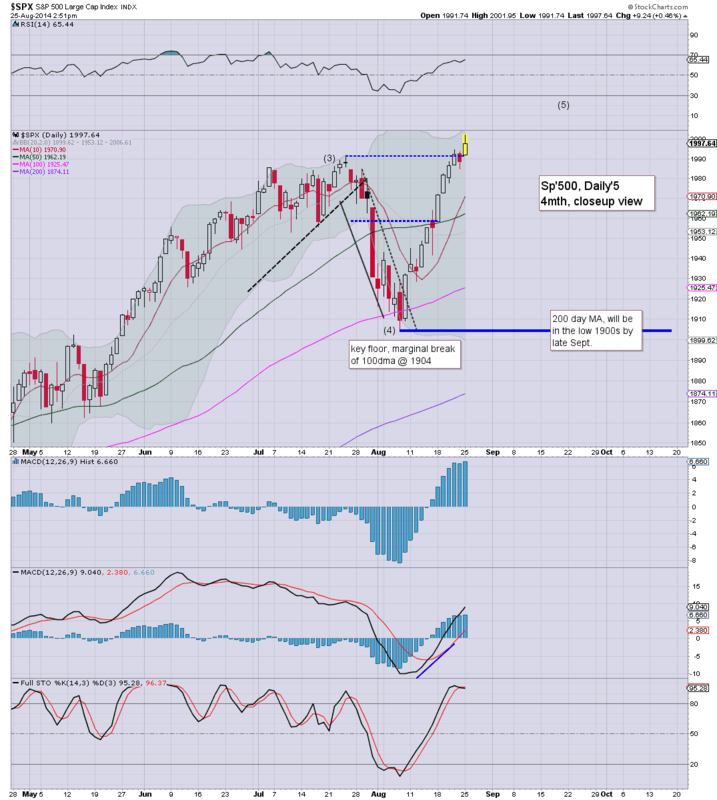 US equities climbed for the 9'th day of 12, sp +9pts @ 1997 (new historic high 2001). The two leaders - Trans/R2K, settled higher by 0.3% and 0.4% respectively. 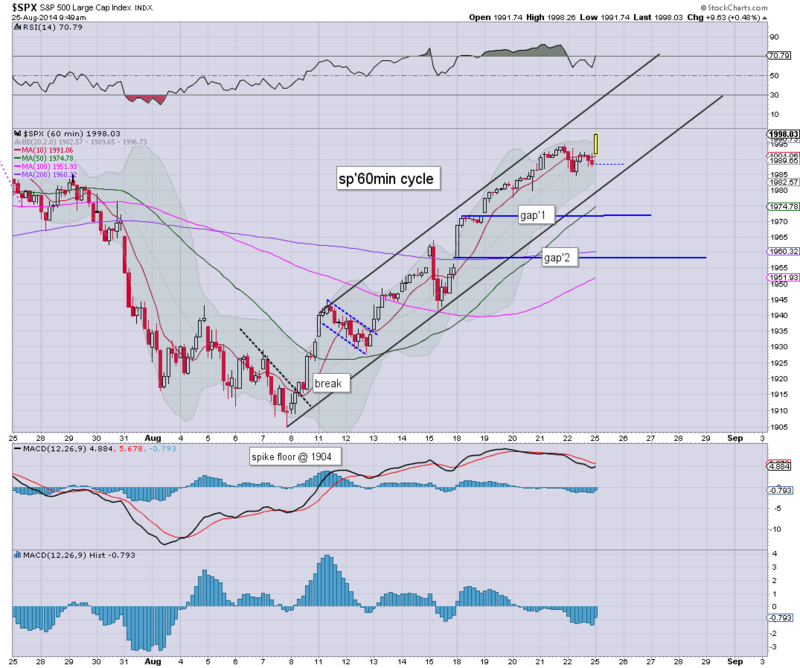 Near term outlook offers a minor down wave of 20/30pts, but that seems not likely until after Tue/Wed QE. ...a very quiet start to the week. Hopefully, things will liven up as the week proceeds. *I remain content on the sidelines, I've no interest in getting involved at these levels, and certainly.. can't short..whilst the weekly cycle is pushing upward. So, the giant sp'2000 threshold has been broken, and many now seem resigned to at least 2020..if not 2050 in September. The big question..is the more bullish outlook - to the sp'2100s still viable? 3.36pm.. sure is quiet out there. It would seem half of 'everyone' didn't even leave the bed today. I can only hope that Q4 will see some serious volatility (at least low 20s)... to end the year with some better price action. 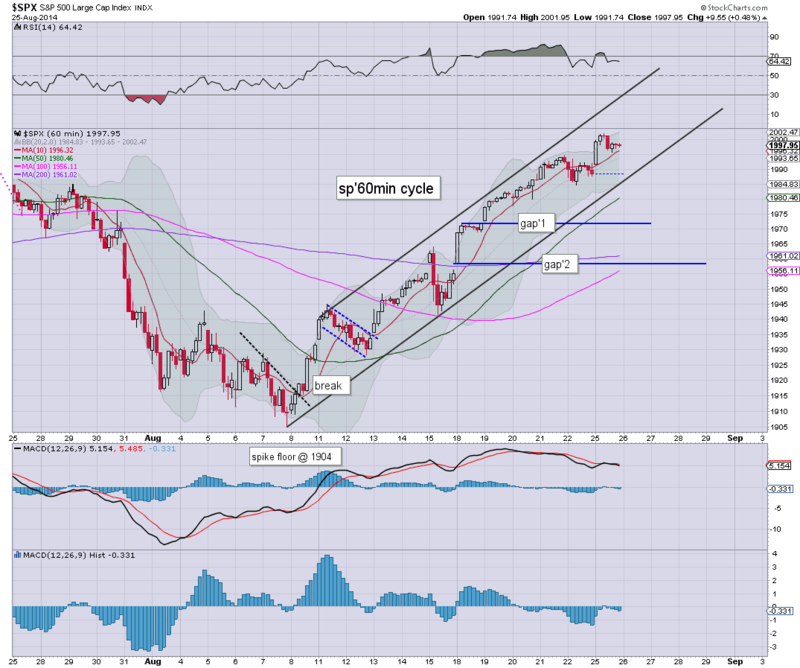 Equities are seeing continued micro chop around the giant sp'2000 threshold. Meanwhile, the NYSE Comp' is back in the 11000s. 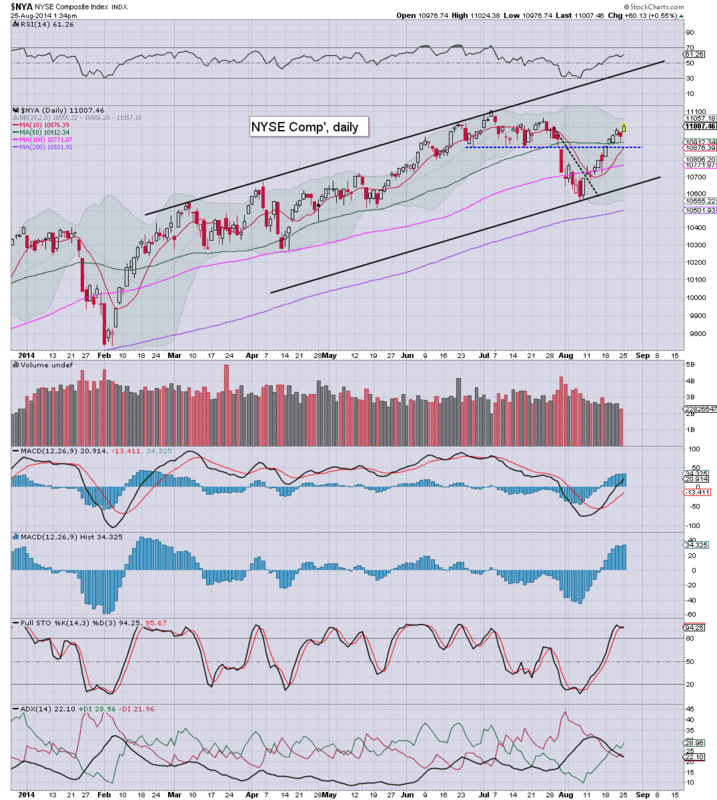 There looks to be viable upside to the 11300s in September, which would likely equate to sp'2050. Whilst the market is somewhat dull (if sp'2000s could be called that)... I'll try to cover a few other things. The 'master index' as I call it, is back in the 11000s...and look set to break a new historic high this week..or early next. Best case upside into early Autumn would remain the $30/32 zone. US equities see a micro wave lower..but it remains a case of 'don't get lost in the minor noise'. With a higher USD, metals remain weak, Gold -$3, with Oil -0.5%. VIX is seeing minor chop in the 11s. As noted earlier, equity bears should be very mindful of $3bn of QE across Tue/Wed. by then.. we could easily be in the 2010s. 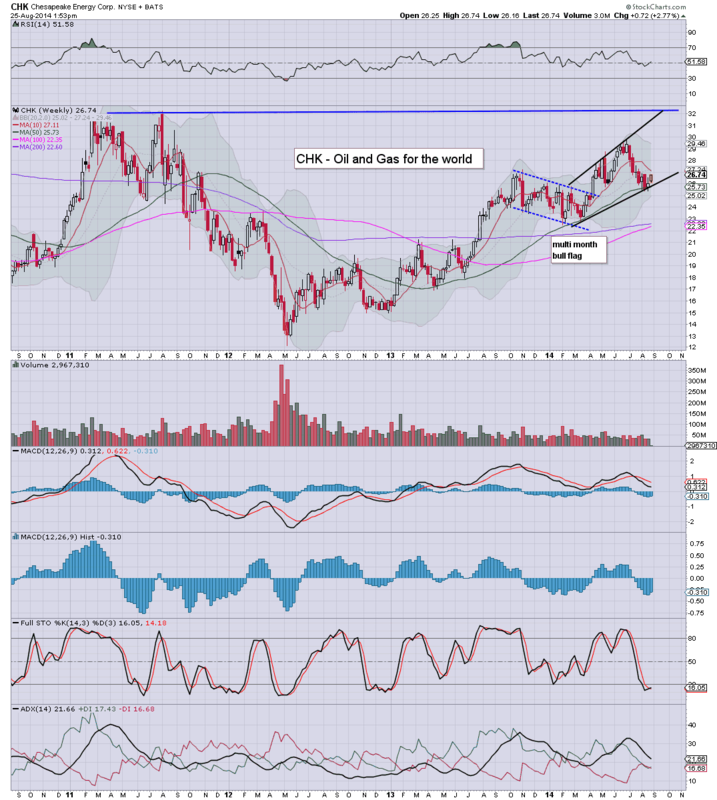 Notable strength: CHK +2.5%. Nat' gas the place to be for the coming winter? US equities are slowly building upon opening gains.. with the sp' battling to hold the 2000s. Equity bears should be especially mindful of a looming $3bn or so of QE-pomo across Tue/Wednesday. That will greatly help offer sp'2010/15 in midweek. A very quiet day to start the week. At least there is some econ-data across the rest of this week to at least give something for the market to deal with. 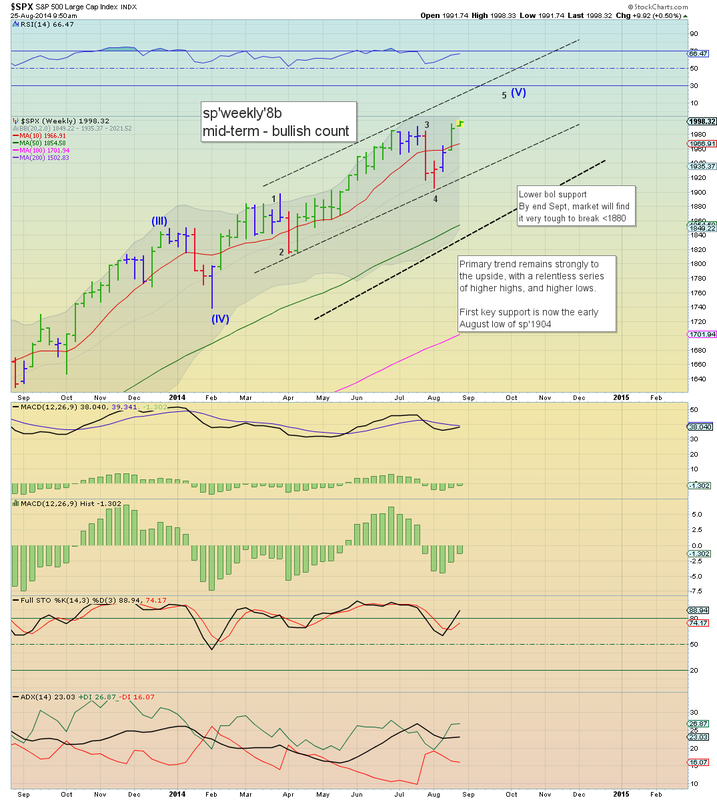 US equities break into the sp'2000s for the first time.. with viable upside to 2010/15 by early Wednesday - as supported by ALL cycles, not least the giant monthly cycle. With the USD on the rise, metals are naturally weak, Gold -$3. Oil is similarly weak, -0.5%. I realise many out there are seeking some form of minor wave lower, but there is very little reason why we'll see even that for at least a few more days. 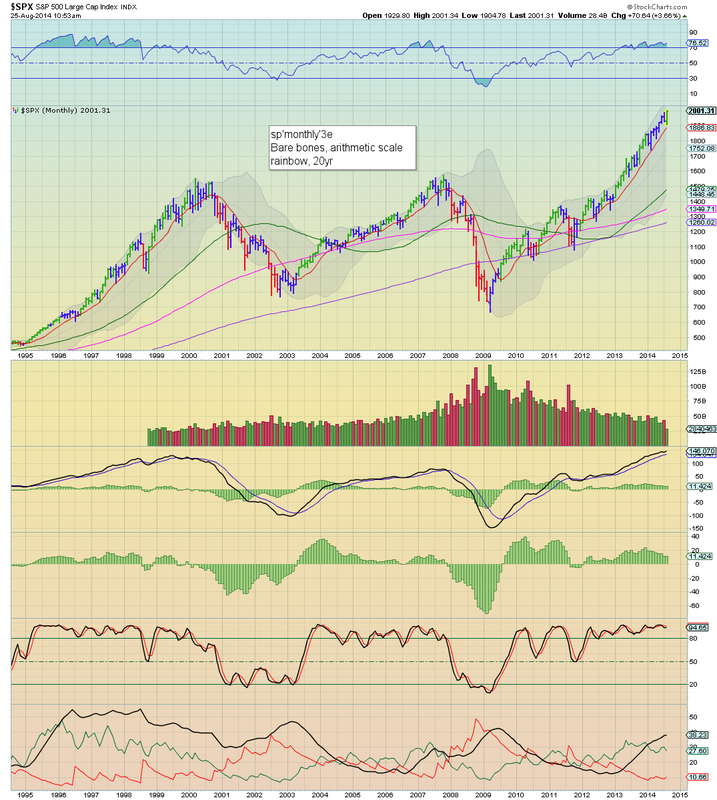 At least to me, most notable, upper bollinger on the weekly cycle remains unchanged in the low 2020s. Right now, that remains the ceiling for the equity bulls. Both of the smaller price gaps - see hourly chart, look out of range this week. *equity bears should keep in mind there is QE tomorrow and Wednesday. Best guess...upside into late Tue/early Wed. We could easily be 2010/15 zone by mid week. 10.14am... and welcome to the sp'2000s. Good morning. Futures are moderately higher, sp +9pts, we're set to open at a new historic high of 1997. 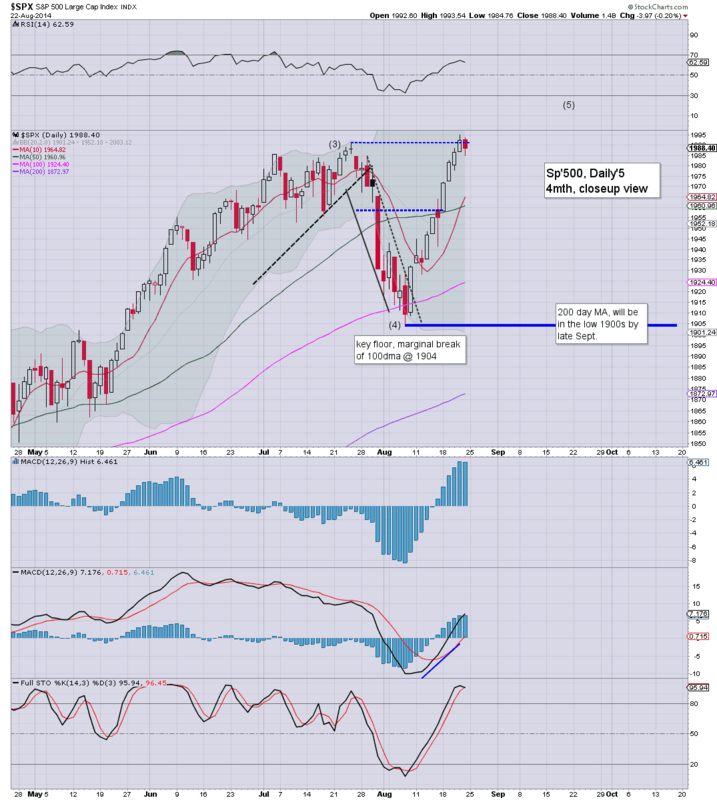 Equity bulls look set for another week in their favour, with the 2010s viable by end month. *it is notable that the ETF - SPY, is trading at 200.00 in pre-market. So...we're set to open pretty close to the giant sp'2000 threshold. A daily close in the 2000s is certainly very possible today - as supported by the hourly cycle.